As we come to the end of July 2011, let’s take a look at what we have to look forward to in August 2011. I’m sure most of you have heard of weekly observances such as “American Indian Heritage Month” but, believe it or not, the list of weekly observances is pretty long. There is also a list of daily holidays that aren’t recognized on most yearly calendar. So if you enjoy celebrating holidays, I hope this list has enlightened you on some new ones. Whether you feel they its appropriate or not, people came up with them for a reason. 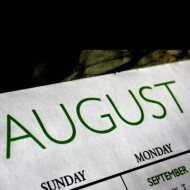 Let’s hope that this August is the best one yet! After all, it is “National Happiness Happens Month”.